Having previously raced at Abergavenny a few years back in the u12s, when he should have been in the u10s, (rookie Dad error) – Saturday saw the return of Jenson to Abergavenny for his 1st crack at a cx National race. Though Jenson has seen success as a rider in the local cx league, due to the low Western League numbers, his BC points have been 3 points, instead of 20, for a class win. This low points haul resulted in him being gridded 2 rows from the back; in a grid of nearly 60 riders. To add to this; a field of over 50 u16 riders would be started 2 minutes ahead of him, on the same course. Challenge on! Dad assumed his usual position of ‘Pit Monkey’ and the 1st whistle blew signalling the start of the u16s. These boys were quick! 2 minutes passed, the 2nd whistle sounded and the u14s were off! Before not too long the u14s were into the double pit section and Jenson had settled in; progressing steadily through his field. From the pits I had a good view of much of the course and in true cx fashion, whilst not able to be sure of his race position, I could see Jenson had passed many riders. he journey home was a good opportunity to catch up on how the race went. 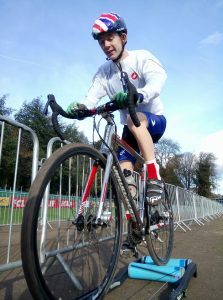 Jense enjoyed it so much he’s entered round 3 of the cx National Trophy as soon as we got back. Having asked Jense how he thought he’d got on he replied “Not sure but it felt like a top twenty finish.” He was not to be disappointed… We caught the results whilst at Mendip cx on Sunday and discovered he had indeed finished 20th and in doing so has picked up National Points! What a result! We’re hoping now that this result will positively affect Jenson’s gridding at round 3. Who knows how he would have finished had his gridding been more favourable? Roll on Round 3! This hill climbing season has been my first ever “proper” racing season. It has been such a massive journey for me that trying to sum it up succinctly is going to be difficult but I will do my best! I guess it all started with my first ever hill rep session in mid September, 4 x 2 mins on Bloomfield road with Khem. To be honest, I really wasn’t feeling like doing a proper session after a summer of just mucking about doing 400 mile weeks riding with friends. I had zero ability in evening out the effort and would start to fade after just 30-40 seconds with each rep. By a minute in I was pretty much just crawling up the hill for the remainder of the effort. Once it was over we went out straight away for another 100k which gives an indication as to how much I cared about the session or doing it properly! A few weeks later Felix and I had a proper chat about BUCs and targeting top 10. This really sparked my motivation to actually try and improve and to be more serious about the specific training. Following this I did a few hill rep sessions alone on Claverton before heading back to Warwick for my first hill climb, Maxstoke. At an average of 5% it was an interesting challenge. I was able to come 1st lady out of 3 which I guess boosted my confidence a bit. After doing much of my later practice on this hill I know I tackled it completely wrong in the hill climb! It is fully possible to big ring the whole thing, which I had been advised to do by may other competitors, but in the moment I wimped out doing most of it in my little ring. Lets just say I have pr-ed on that hill multiple times in the last couple of months! The following weekend I did a double hill climb on Burton Dassett and Edge Hill. Un-typically, I was able to spin out there nice and slow allowing me to do a pretty decent time up Burton Dassett. That was the first hill climb/effort for which I was able to push hard through the finish which I was really happy with. After a big effort already, Edge Hill (the steeper and longer and overall harder of the two hills) became more of a question of just getting up and being able to hurt at least a little bit rather than anything else. I managed that so was quite pleased. Again I came first woman. Yes, out of 1, but it still counts right? Oh yeah and I met some nice guys Ash and Justin who gave me a fast paced ride home, allowing me to satisfyingly completely wipe out my legs. The weekend after that was my first CTT time trial, Dovers hill. Yes I got lost. Yes I missed my start. Yes I got a mis-recorded non-win, which I will not try to explain (it was hard enough trying to explain what happened to Felix!). It was overall a masterclass in how to not compete at a hill climb. Anyway I “won” 2 camelback bottles so I’ll take that. I always wanted some of those bottles. The weekend after that I came back to Bath for Priddy and Burrington. I was pretty nervous to be honest as I knew Iâ€™d be racing Fran and Kate and it would be hard for me not to want to compare myself to them. Anyway, going out to Priddy hill climb in the car with the others was really nice and chilled and I almost forgot about the fact that I was about to do a serious race! I was first off, so on arrival I had to try my best to get “in the zone” pretty much as soon as we got there. Doing the hill climb, my heart rate rose really quickly and it wasn’t long until I saw it at 190, far higher than I had ever seen it before. Having the support of friends on the hill for the first time was awesome and definitely helped me over the top. I enjoyed watching and supporting the others afterwards even though my lungs were burning the whole time. On reflection, I think this might have been my best performance of the whole season (yeah, BUCs didn’t go to plan 🙁 , but I’ll get to that). Anyway, I didn’t beat Fran or Kate, but I wasn’t too far off (maybe 30 secs or so) and I knew I had done my absolute best, so I didn’t mind. Also they were really encouraging about what I had done so all in all felt like a successful day! The ride out to Burrington the following day was so nice and relaxed. When we actually arrived, we all got cold pretty quickly and my motivation was just not there. My start time was way before the others but I just wanted to hang around with everyone instead of doing my effort. This led to a sprint avoided late start which isn’t how you should start a hill climb. Anyway, on finishing my performance ok. Ok is literally the best way to put it. I was enjoying being with all my new friends so much that I wasn’t really in any racing mindset. Obviously when I got to the hill I tried my best. But I felt like I didn’t have the laser focus to suffer just that little bit more which you need to do well in hill climbs. Anyway, I did ok and it wasn’t BUCs yet so it was fine. The following weekend was BUCS. Oddly there doesn’t seem much to so much to say about the race. I didn’t feel nervous until I started warming up maybe 30 mins to go. Then all the nerves came. I got to the start with 10 mins spare maybe more (I was NOT going to be late! ). At the start line I just felt absolutely TERRIBLE. I have never felt so nervous in all my life. I tried my usual technique of telling myself how stupid hill climbing is, but it didn’t work. About 40 seconds in to the climb, my mind starting telling my legs to stop and give up. I knew deep down that I couldn’t, enabling me to continue moving upwards. As soon as I saw the finish and the girl in front of me I was able to use that to push over the top during the last 30 seconds or so. On sitting down at the top of the hill, the elation I felt was unreal. I was just so happy it was all over I couldn’t even think about time or position. Anyway, long story short I came 19th. 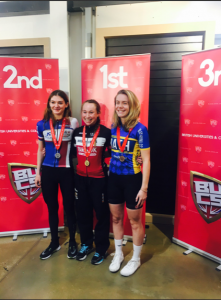 Putting in an UNBELIEVABLE effort, Fran had come third and had also got a team second place of Bath. Celebrating this I was able to block out all thoughts about how I had done for most of the day until I got back home. Once it had all sunk in I was pretty disappointed. Only 8 seconds away from my goal of top 10, I felt that I had let myself down, as really I should have been able to cut that time if my focus had been better. Anyway it was done, and 19th national university competitor is a pretty good achievement. Next year I will be back and hopefully well within that top 10. A recce of the hill felt like a full gas effort, so steep and unrelenting. With a cross tail wind on the lower part you turned into a full head wind for the final few hundred meters. It was hard, steep and in every way completely horrible but there was a great crowd and support from Khem, Emily and Nancy as well as everyone else who were out there even in rubbish weather. It was just really hard and nerves where the worst I’ve ever had… very surprised with the result! And Saturday’s racing was not done there. Kate Baker was taking part in a team relay event in Windsor with some of the guys from the Uni of Bath. 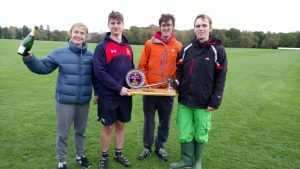 This was a 25 hour relay making the most of the extra hour as the clocks went back. What is it? An endurance cycling event lasting 25 hours. 4 riders per team, with 1 rider per team on course at any one time. Where? Windsor Great Park on ~6.5km closed road circuit. Rather than an extra hour in bed, last weekend I had no hours in bed. The inaugural Red Bull Timelaps event was fast, furious, surreal and very very brutal. The event was due to take place over 25 hours (from 12pm Saturday til 12pm Sunday – clocks changed remember). Within the first hour there was a big crash and very unfortunately a rider had to be taken to hospital. I later found out he was part of one of the teams road cc had brought along – Dave Atkinson and I were chatting and he mentioned a broken pelvis. The race re-started at 14.00 with a heightened sense of nerves and anticipation, and any distance made in the first half an hour was wiped. James Pheysey had started us off, fortunately escaping the crash. Mike Beech took over when the race re-started, and, in classic Mike style, he. was. smashing. it. After Mike came Will, James’ friend from school. Then it was my turn. My HR was 185-190+ for my first stint of 5 laps (just under an hour), and the same for the second stint. 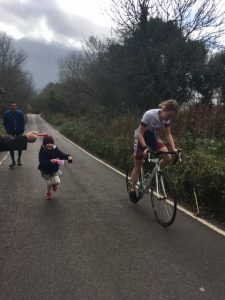 Unsurprisingly, I felt sick for most of my second stint – it was genuinely like doing a flat out crit after having just done a flat out crit. When I got back to the pits and after a few tears, I realized I couldn’t keep doing maximal efforts clinging on to wheels for the hours to follow, so I knew from then I was going to watch my HR and aim for more of a sweetspot effort, working in groups where I felt I could manage it, not where I felt like I was going to blow up every other minute. Riding around Windsor park at 4am was quite surreal, and at 5am when I got off my bike after my fourth stint I headed to the (awesome) heated marquee to try and nap for a bit. When I woke up on the comfortable (*ahem*) bench, it was daylight again! Very surreal. After that nap, I chatted with Heather Fell (Ironman machine and GTN presenter) for a bit before heading out for my final stint. I’d joined a chain gang near the beginning of this stint, but I’d fallen off the group when I felt I needed to take a gel and we’d just hit the little stinger of a climb on the circuit (I swear it actually got steeper the more we rode it). A big part of me wanted to be with the group, but a bigger part knew I was done in and so just took the gel and rode round with whatever I had left (not much). My HR average for the final stint was 165, just a “small” drop off from where I’d started – no surprises there. It was an incredibly tough event, and I’ve only scratched the surface of what it was like, but I would genuinely recommend trying it for yourselves, assuming Red Bull put it on again next year. Maybe we could get an Avid Team going!